One of the favourite exhibitions in the museum is the bones of Nellie the elephant which were found in 1988 by Earnest Deacon builders while digging the foundations for a new house in Tanhouse Meadow. Most of the bones were recovered and are now on display in the museum. Elephants Death – Collapse after walking from Leominster to Kington. 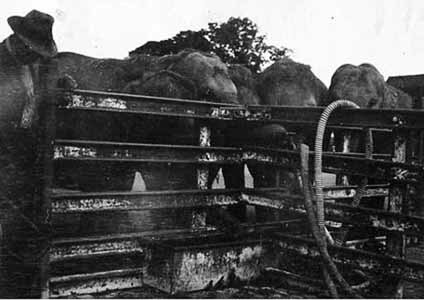 Chapman’s Circus, which visited Leominster on Monday, suffered a severe loss at Kington on Wednesday evening by the death of one of the elephants. 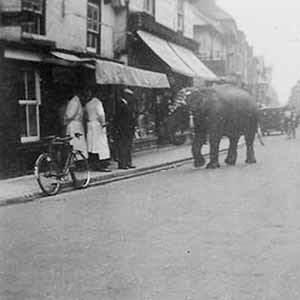 The animal went in advance of the main body, advertising the coming event, and while walking from Leominster to Kington it fell ill.
On arrival in Kington, Mr W Munslow, the veterinary surgeon, was called in but despite the best of attention, the animal died on Wednesday. The animal, which is stated to be 47 years of age, and to weigh two and a half tons, is to be buried in Kington. The story of Nellie’s demise was long recounted in pubs for many years in Kington, becoming part of local folklore. So, when the bones were re-discovered by Deacon’s builders while excavating the foundations in 1988, solving the puzzle of why an elephant’s bones should be buried in Kington was easily done. The bones show that Nellie was a fully mature female Asian elephant who stood about seven to eight foot high. 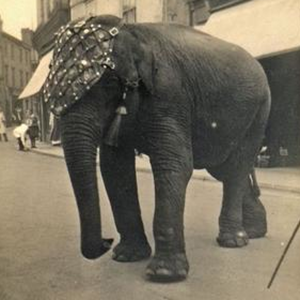 We have two photographs of Chapman’s Circus elephants in Kington in 1932, but we don’t know if any of them depict Nellie.